This was drawn with a 3B leaded pencil, on a 8�" x 11" High Bright (87) smooth finished paper. 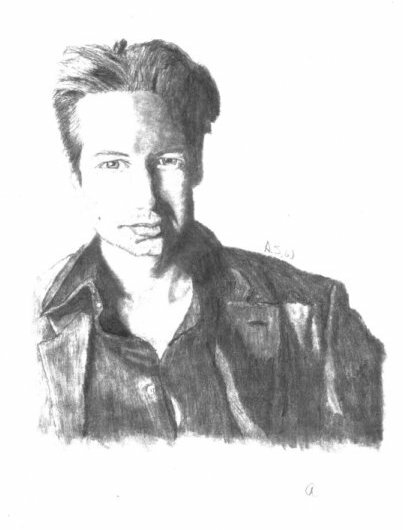 This was my first attempt to draw Mulder realisticly instead of an out-lined drawing, this drawing took two days to draw. For me, Mulder, is one of the hardest to draw, he is so 3D looking. I blended it with a soft papered tortilon. This is not the orignal drawing I copied it so that I could send it over seas without losing the orignal. That is why the pic looks sharp instead of smooth.